Just in from betaToys, it is the Soul of Chogokin Ideon! Ideon hails from the anime Space Runaway Ideon (伝説巨神イデオン Densetsu Kyojin Ideon) also known as Legendary Giant God Ideon. This influential anime ran from 1980 to 1981 and was created and directed by Tomino Yoshiyuki of Mobile Suit Gundam Fame. “Space Runaway Ideon begins in 2300, far enough in the future that mankind has begun colonizing other planets. 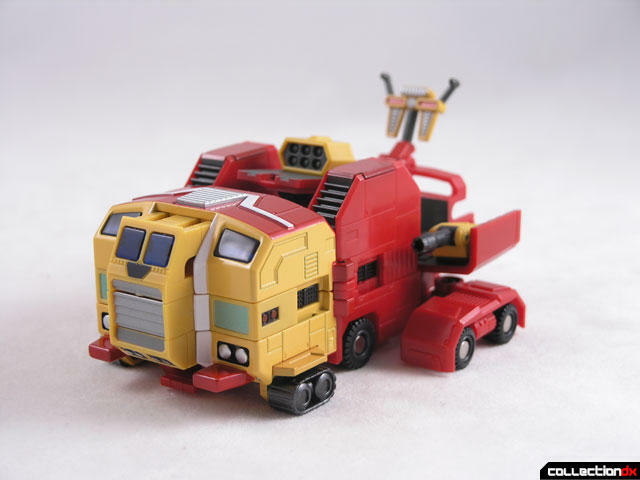 On the planet Solo in the Andromeda Galaxy, a group of archeologists had come across the mysterious remains of the Ideon—three large armored trucks with the ability to transform into a godlike mecha. They also come across a large spaceship. For six months they had diligently restored the machines but failed to get the giant tanks to move. Suddenly, a humanoid alien civilization known as the Buff Clan comes across Solo. Karala, the daughter of the Buff Clan's military commander flies down to the planet against orders to investigate (her commanding officer, Gije, is reluctant with her, due to her standing and the fact that he once was a soldier under her father). She is pursued closely by commrades sent by Gije, but they lose sight of her. Assuming the "aliens" (Earthling colonists) have attacked Karala, the Buff Clan begins to attack. Cosmo Yuki, the afro-wearing protagonist of the series, climbs aboard one of the three tanks and, when it initially forms the Ideon, fends off the first assault, repelling Gije's men. This is a short respite, though, as another force is sent down soon after. Bes Jordan, leader of the sparse military force stationed with the colonists orders that the Ideon tanks be armed with missles, but while that's happening the cities on Solo are obliterated by the Buff Clan soldiers. An air raid siren is sounded and the survivors, using the Ideon for protection, board the spaceship found with the Ideon (known as the "Solo Ship") and flee. The survivors travel from planet to planet, constantly pursued by the Buff Clan who desire the Ideon for themselves along with the mysterious energy source behind them, known only as "Id" or "Ide". I’ve always heard that Ideon was probably the most powerful super robot in anime history, and after reading up on it and watching some clips on youtube, I tend to agree. The combined Ideon mecha wields god-like power, with the ability to cut entire planets in half. The series is also known for its exceptionally grim ending. Prior to the release of Yamato’s Ideon toy, I had no love for the design at all. 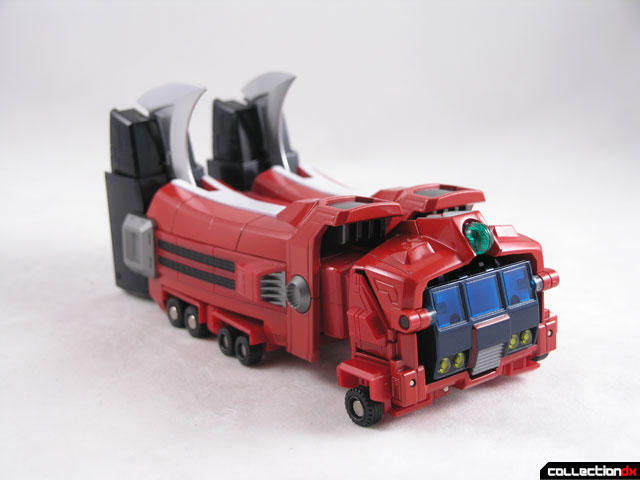 The previous TOMY toys had odd proportions and just looked ugly to me. 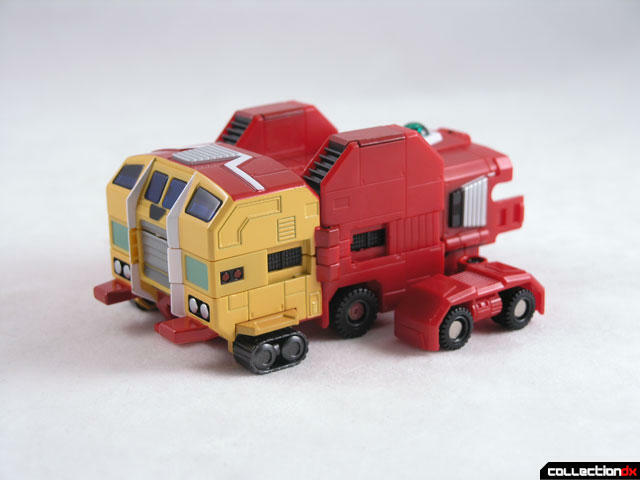 The Yamato toy sold me on the idea that the Ideon could be a dramatic character, but since it was a non-transforming toy, I had no idea that Ideon was made up of three vehicles! Not only that, but each vehicle has two separate modes! 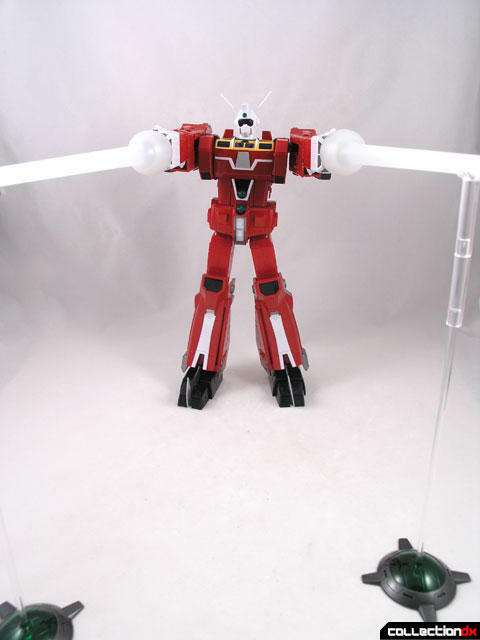 A Mecha Transforms into the arms and head of Ideon. The mid point of the arms are made out of diecast, the rest is plastic. The treads are rubber and really roll. B Mecha forms the torso of Ideon. The large front of the vehicle is metal, and all of the wheels are rubber. C Mecha forms the legs of ideon and makes up the bulk of the weight. This unit feels like a solid brick of metal – with the only large are of plastic being the upper thighs. 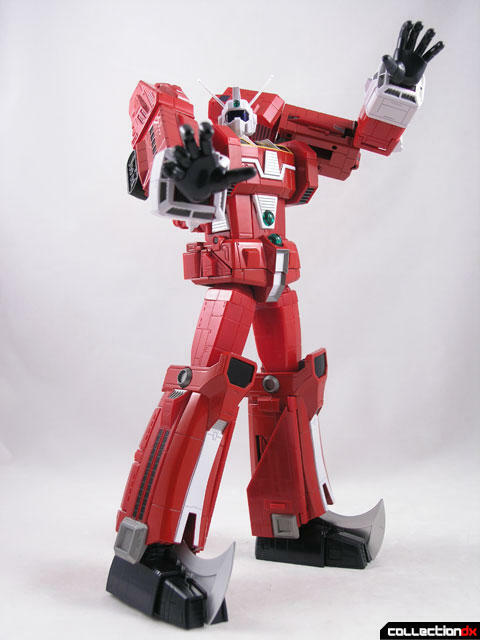 Combined, Ideon stands 12 inches tall and weighs about 3 pounds. This is one heavy chunk of gokin. 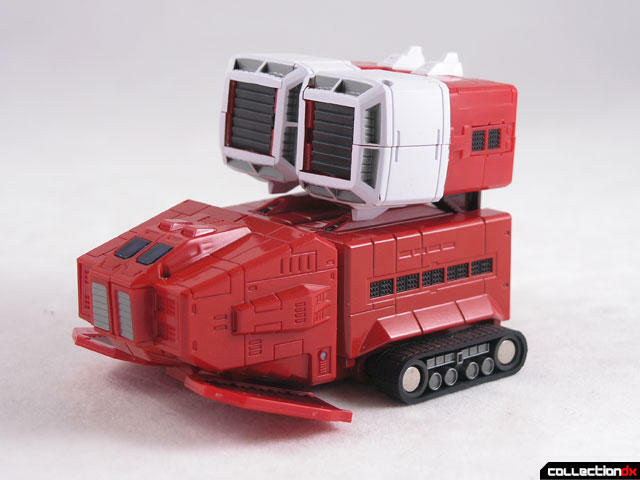 It is very reminiscent of the classic DX toys. Ideon comes packed in a nice Styrofoam tray with the accessories packed in a clear plastic tray below. 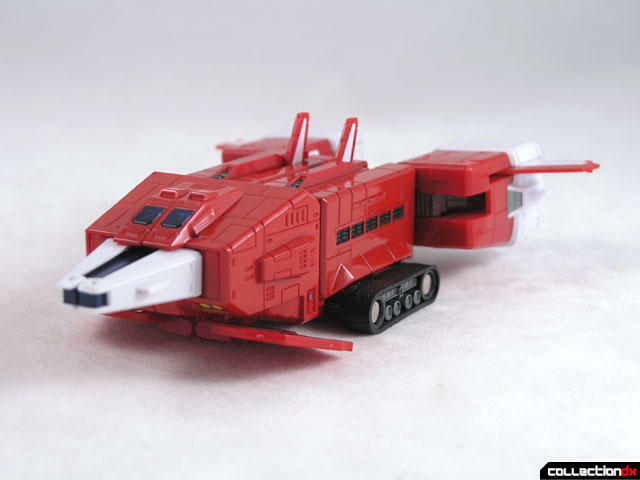 Combining Ideon is not hard provided you follow the instructions the first few times. The only difficult part I found was collapsing and expanding the legs of the C Mecha. You have to push or pull them exceptionally hard to get them to move. Once assembled, Ideon is an imposing figure. Articulation is decent but there is no waist joint. This is not a toy that can pull off dynamic poses, but what it can do, it does well. 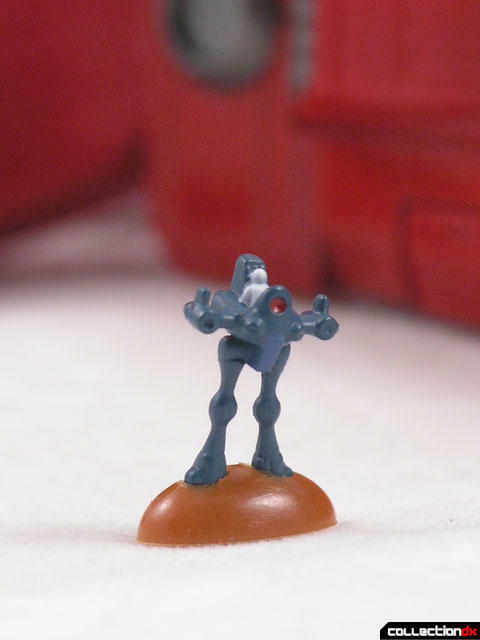 The head is on your standard ball joint and features soft pliable antenna. The antenna actually push into the head during transformation. The shoulders have a full range of motion and attach to the arms via detented metal joints. The upper sections of the shoulder have a small bit of articulation, just enough for them to move a little bit when posing. The bicep areas are metal and then they are connected to the lower arms by a metal bar. Here the arm can twist and bend. 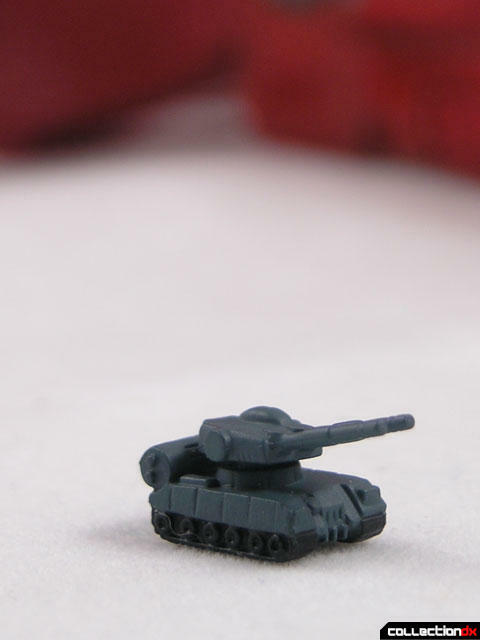 The fists are rubber and attach via a ball joint. There are 4 separate sets of hands included. The legs connect to the hip at a unique dual joint. Instead of attaching to the body, the legs connect to a bar that attaches to the back of the waist. This enables you to swing the legs lower and achieve a sitting pose. However, on my Ideon, this joint is a bit loose and causes the Ideon to bend over backwards if not posed properly. The upper thighs twist, and the knees click back and forth. The feet are on ball joints and provide a stable foundation for the toy. 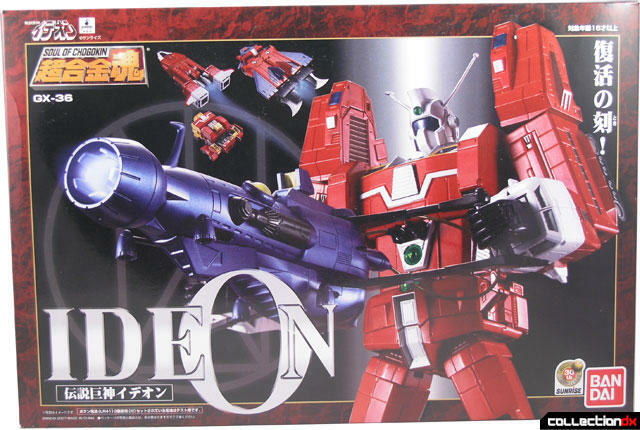 Like most SOC toys, Ideon comes with a ton of accessories. 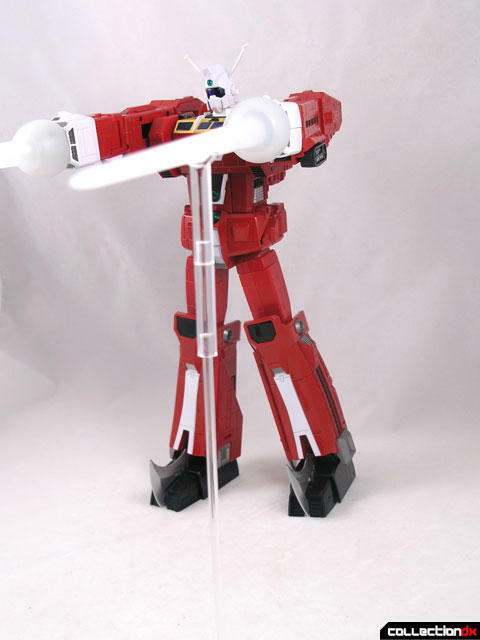 One of the most striking is the ideon sword – to long plastic transparent tubes that attach to the hands. 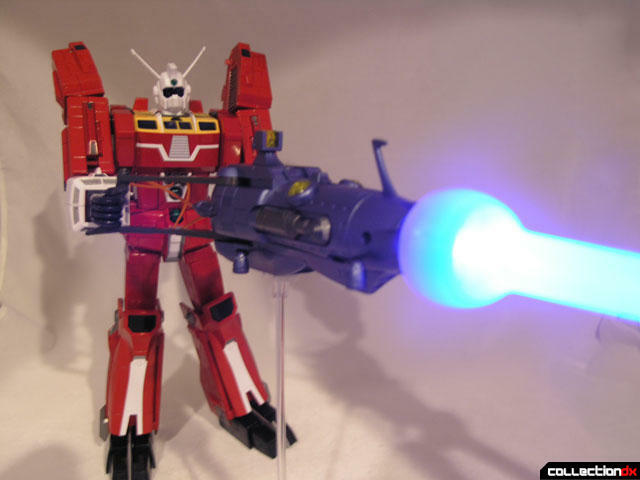 These are meant to replicate the dual beams of energy that comes from Ideon’s hands. Two stands are included to prop up the ends of the beams. 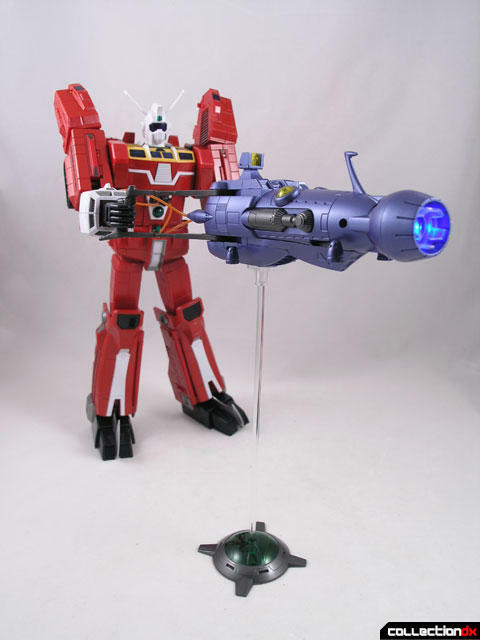 Also included is the Ideon gun. 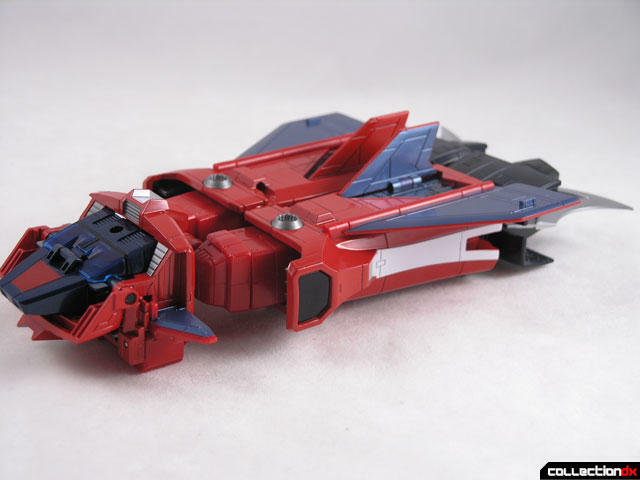 Looking something like a spaceship, this gun is one of Ideon’s ultimate weapons. The gun itself is a great toy; the leg pods extend and retract, the target scope raises and lowers, and best of all, the gun lights up. A blue LED is activated when you slide a switch on the top. When you first remove the gun from the packaging, you must remove a blue safety tab to be able to move the switch. A special set of hands is included so that Ideon can grasp the gun. 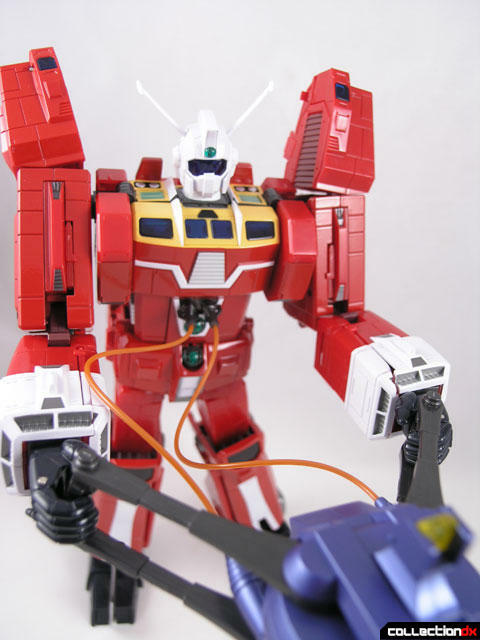 Ideon also includes a special chest plate that allows you to attach power cables to the gun. The Ideon Sword blades can be attached to the gun as well. When not in use, the gun can be mounted on the stand. The stand is designed to replicate the look of the Solo ship. 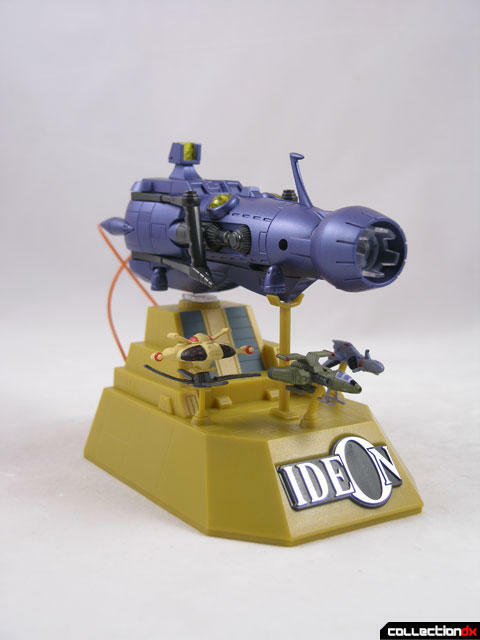 The Ideon gun is mounted at the top of the stand while three support ships can rest on smaller stands. The stand separates in such a way that you can store the extra fists in the base. 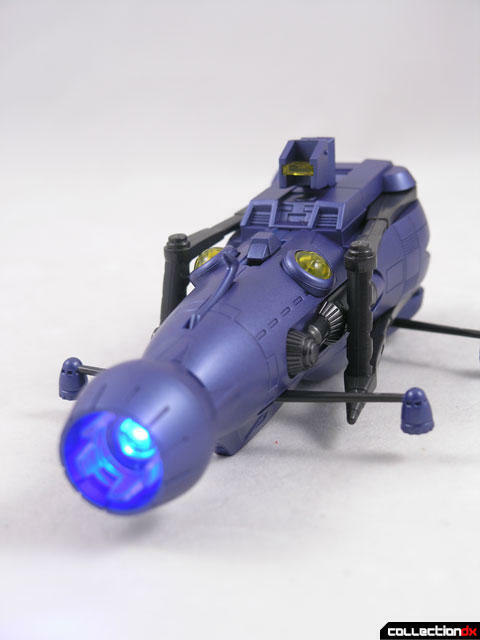 Also included are 10 insect like vehicles called Jyongs, 2 walking machines called Gadakka’s, and a robotic tank. If I had the money, I'd buy it right now. I actually bought it today finally ! It's everything I hoped it would be, and more ! I agree with you to what you said to Mr. Kidnicky this past January. Ideon is not crap...at all. I am a die-hard fan of anything Ideon. I love your review of the SOC version, and I've bought it last year. I love the freaking toy so much, I've bought another one. You're absolutely right, Ideon isn't crap and neither is the anime. I've noticed you haven't seen the TV series in whole when I last saw your video review of it. If you still haven't seen it, I strongly recommend you to watch the anime. You won't be disappointed. Thanks again sir, you're the man. 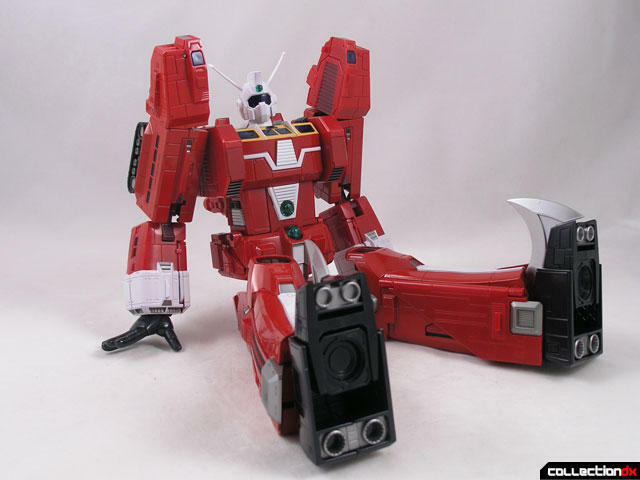 Ideon looks great, the SOC line just keeps getting bettr and better. 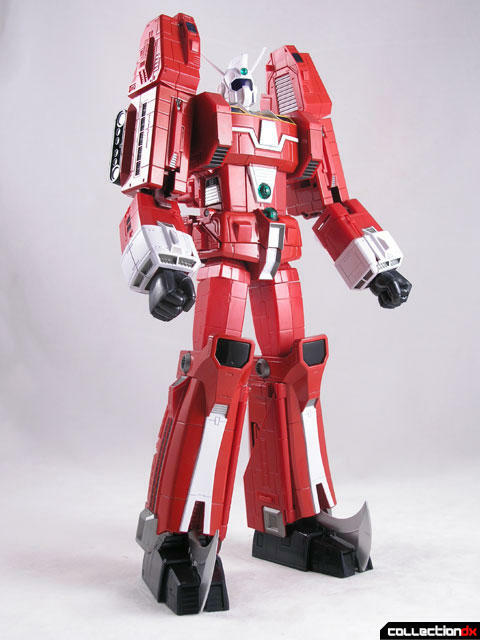 Is it just me or does Ideon look similar to the Dai-X robot from X-Bomber/ Star Fleet? 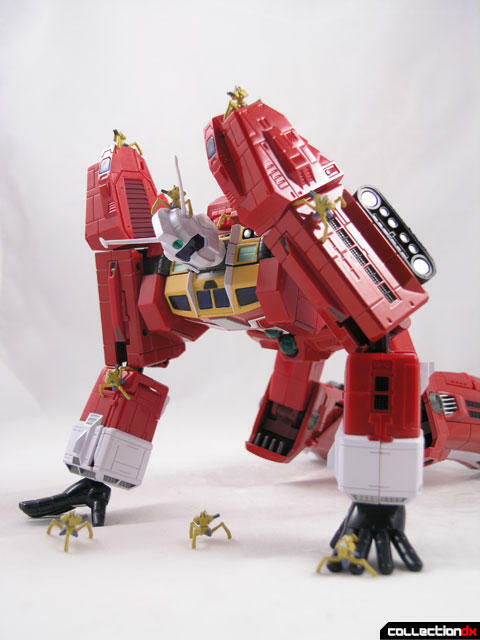 Looking at Ideon builds my confidence that Bandai could easily and hopefully will build a Dai-X for their SOC line. To anyone who has not seen X-Bomber, you need to see it. Finally found one of these at a reasonable price. Wow! Was not expecting the size or weight to the beast. This is one that I wanted for having watched and greatly enjoyed the anime. (Well until things went weird at the end, but..."anime"). I always loved the way the show made the robot seem awkward, stiff and ponderous. But at the same time unstoppable. The SOC does a great job of capturing that.